Thinkspace is proud to present Kari-Lise Alexander’s latest body of work ‘WAKE’ in our project room. 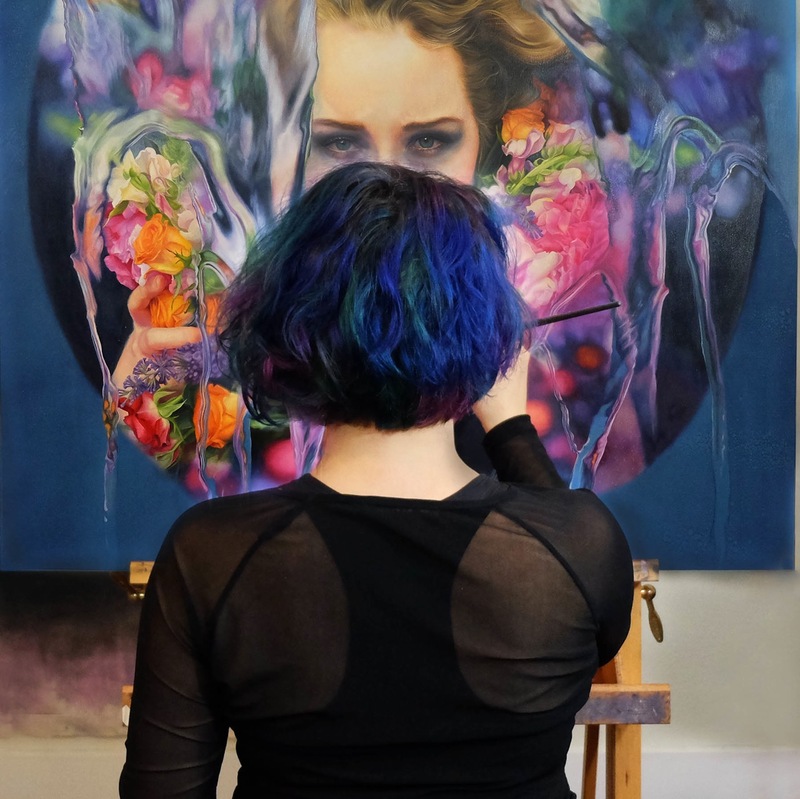 Seattle-based artist Kari-Lise Alexander draws inspiration from her Scandinavian heritage painting ethereal portraits that capture transformation and vulnerability. In anticipation of Alexander’s upcoming exhibition with us, we have an exclusive interview with Kari-Lise Alexander to discuss her creative process, progression in her style, and what a cocktail inspired by her work would be made of. SH: What themes or ideas were you exploring in this latest body of work? 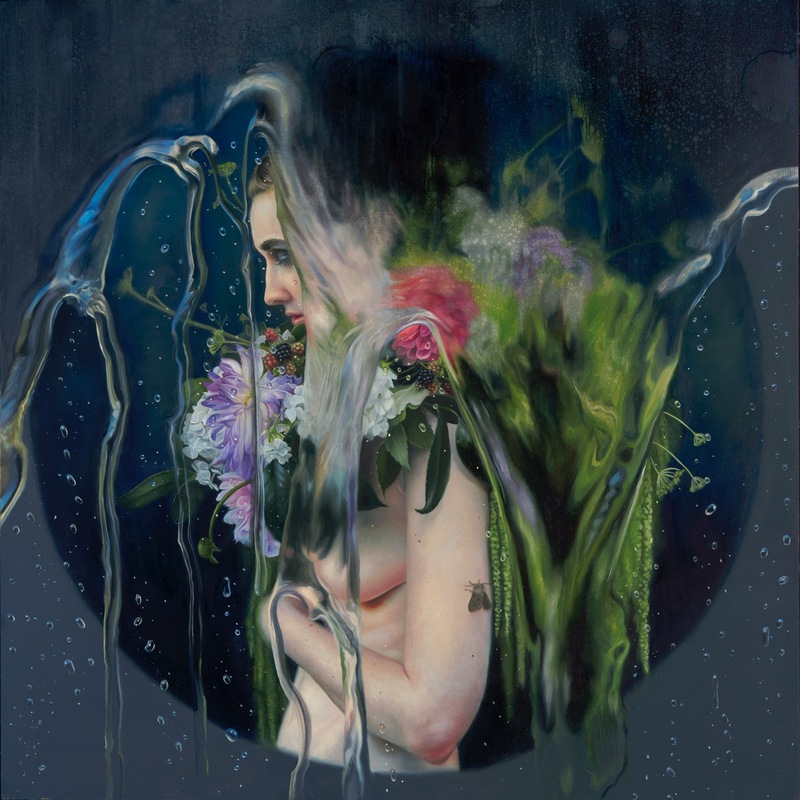 KLR: I wanted to explore a few different themes through the use of water and the abundance of flora in this series. First, water is never the same it’s always changing, shifting and taking different shapes. 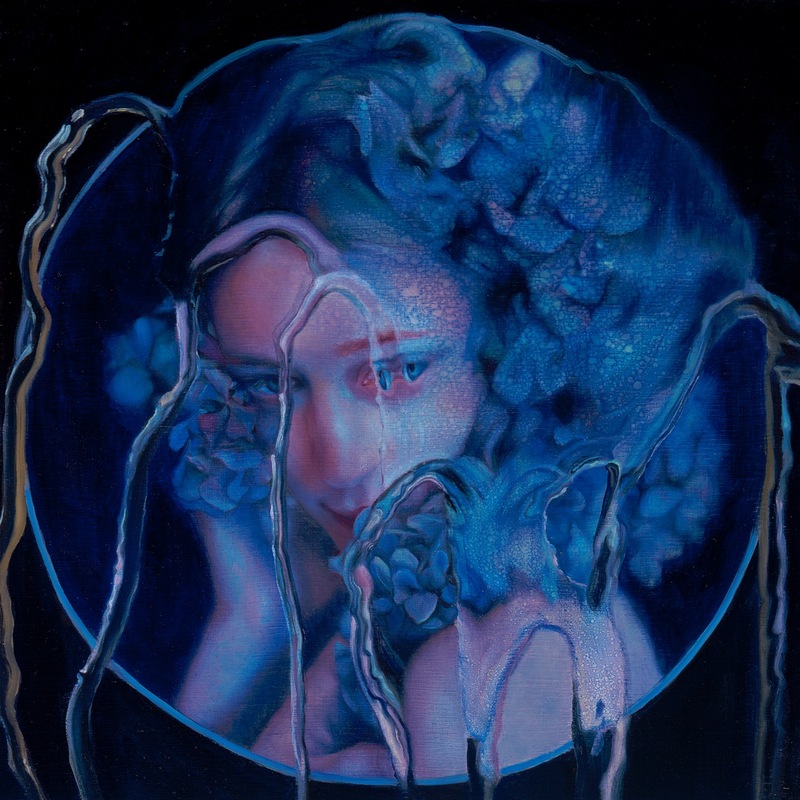 I wanted to use water to explore the changing perceptions we have of individuals and also use it at the same time to create a dreamy, mercurial, and surreal feeling to the pieces. 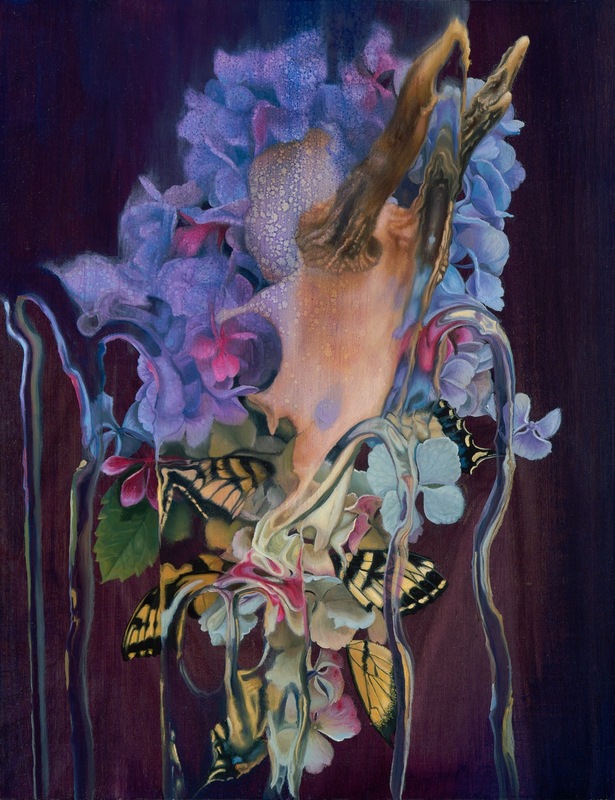 Second, the prolific and very lush flora creates a similar feeling of dreaminess and richness throughout the work. Both the water and the flora distort and block the viewer from seeing the subject clearly, leaving us wondering what we might be missing. SH: In this latest body of work you’ve really played with the movement of water, surrealist elements, and an inner illumination of color – what inspired this new direction/ evolution of style? 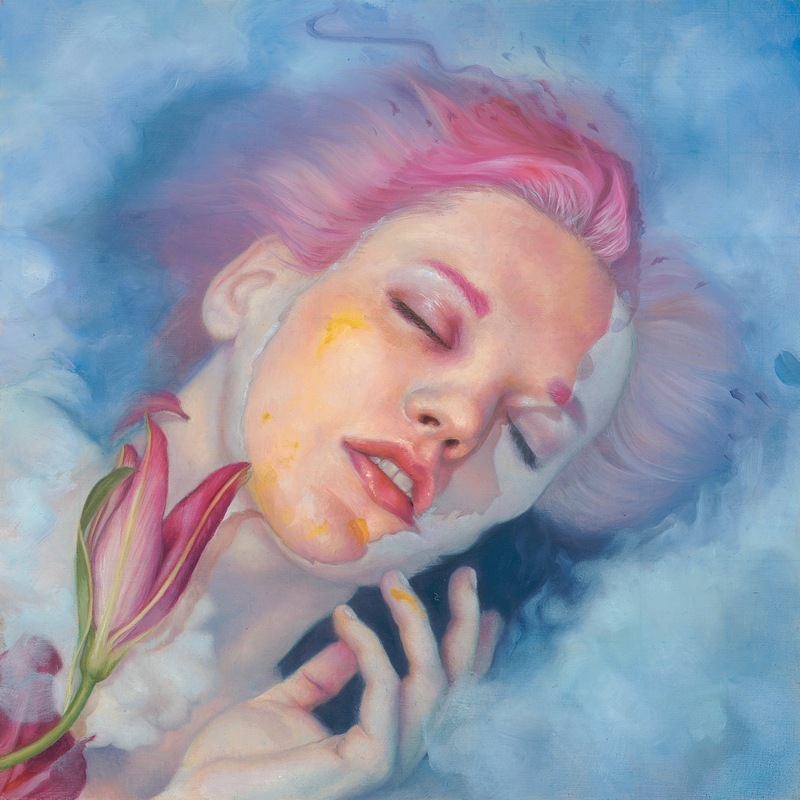 KLR: It felt like it was a natural evolution in my work to expand my use of water in my painting. In this series there’s flowing water, still water, water when it’s raining and surreal cloudy water. It created an overall feeling that is moody, dream-like, and introspective all at the same time. 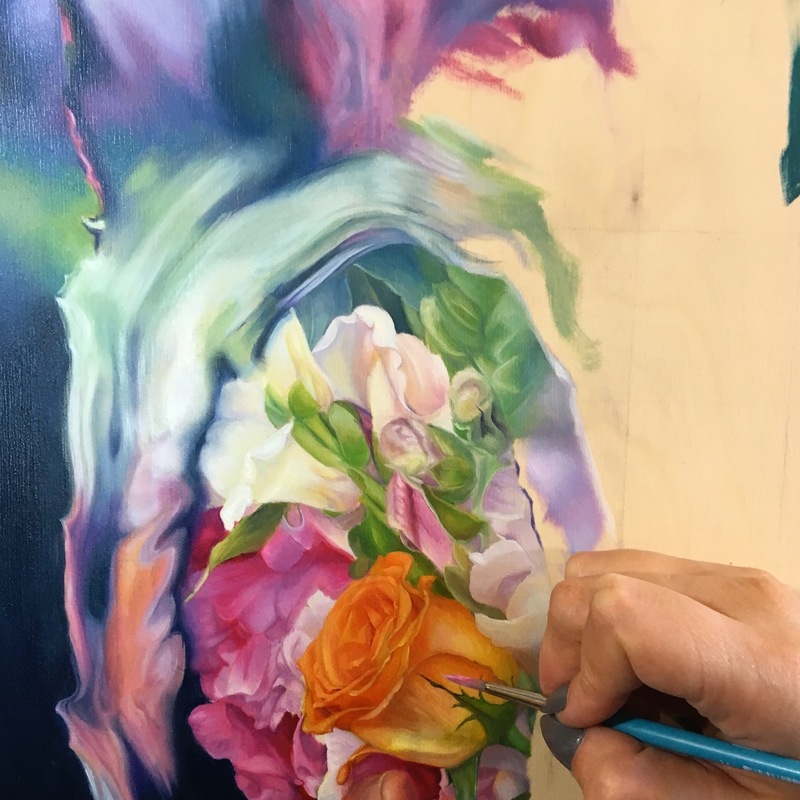 The other elements in the series reflect that as well such as the highly saturated color palette and the plethora of flowers that dominates the pieces. SH: Walk us through a day in the studio? KLR: I typically get up get my coffee, snuggle with an animal or two (I have two dogs and two rabbits, not to mention several insects) and then head down to my studio and get to work. Depending on my schedule I usually paint 6-9 hours each day during the week. I do spend a lot of time brainstorming, sketching out ideas, planning upcoming photo shoots and working with models as well. KLR: My favorite thing about another artist’s work is if it surprises me. These pieces usually involve a smart narrative in the work, great color usage, and composition. All of those things might sound obvious for a painting or work of art, but as any artist will tell you are very challenging to get right. When a piece “surprises” me like that it’s really a delightful thing. SH: How does is it feel to be an active artist a part of the new contemporary art movement? How do you think it will be documented in art history? Give us your one liner. KLR: I’ve never thought about myself as an active artist within the new contemporary art movement. But, I suppose that is very true. All I really think about is what I want my voice to be in the art world and what I want to say with that voice. I’m not really sure how new contemporary art will be documented in art history. The world moves so quickly now, and artists are trying to keep up with trends and get “likes” that I’m not sure if the movement will be here for a moment or if it will be here for some time and be notable to history. SH: What are the most challenging aspects of being an artist? What are the most rewarding? KRL: This is a hard question to answer, but a good one. I think the most challenging thing is not to let yourself get in the way of creating the art you want to. I think we tend to be our own biggest obstacle when it comes to doing anything creative. We make up reasons why we shouldn’t, we tell ourselves we aren’t good enough, and we are constantly the worst critics of what we do. We look at other artists success and judge our own work by it. All of these things get in the way of actually creating art without fear and creating the art we want to. I learned a few years ago that if I spend time tearing myself down about my work, I’m actually wasting time instead of working on the thing/s I don’t like in my own work. It’s ok to be critical of your own work in a healthy way. However, it is not ok to be mean to yourself about it. One is productive, and the other is destructive. The most rewarding thing about being an artist is creating a piece that you’re truly proud of or in this case a series of paintings. “WAKE” is a series I’m really proud of, and it feels like the compilation of years of what I’ve been painting and trying to figure out in my own work. SH: If you work was translated into a cocktail what would it taste like? What would it be made of? KRL: Well I think with this series I’d have to say it would be something fantastical with lots of different floral notes. I think it would also have to be a really colorful drink. Definitely served on the rocks with a few flower petals as a garnish. My only fear is that with all the water that is featured in this body of work the cocktail would end up being watered down! SH: What were you listening to while creating this latest body of work, music, podcasts, Netflix? KRL: I listen to audiobooks when I paint. I found it works best for me since I don’t have to keep looking up at a screen. Audiobooks tend to go on for hours without having to play the next episode, or stopping everything to find something new to watch or listen too. I listen to a lot of fantasy books on audio. The King Killer Chronicles, The Night Circus, and Jonathan Strange and Mr. Norrell, have been some of my favorites I’ve listened to in the last year. SH: Do you experience creative blocks? If so how do you push through it and find new inspiration? KRL: Of course I experience creative blocks! I don’t know any artist who doesn’t from time to time. Mine usually pop up when I’ve been working really hard and haven’t given myself a break. I usually have to force myself to stop working and step back from my art. Otherwise, I’m forcing it, and I get frustrated when it’s not working out. What usually helps me is getting out into nature or going a museum. Something to get me out of my head and look at the wider world. SH: What artist (it can be in painting or a different art form) would be a dream collaboration? KRL: Well I would want to go back in time and collaborate with my favorite artist from the Pre-Raphaelite movement, Eleanor Fortescue-Brickdale. I love everything about her work from her use of color, to subject matter and composition. I think it would be amazing to collaborate with an artist that is at the top of their game and has a breadth of understanding about their craft that she did.